Throughout the first century of its existence, the Society inspired its members to aid the victims of starvation, eviction and exile from Ireland. This was especially true in the 1840’s when the calamity of the Great Hunger, the starvation due to failure of the potato crop and the evils of an oppressive government afflicted the Irish people. During this period when Ireland’s population was decreased by five million, the Society’s members worked with members of the Society of Friends and numerous other groups to relieve the starvation suffering. As late as 1879, the Society’s minutes show continuing concern for starvation conditions in Ireland. Toward the end of the nineteenth century, the Society extended aid to victims of floods and natural disasters. The Johnstown flood of 1889, the San Francisco earthquake, the Russian Jewish Relief Fund and victims of the Spanish-American War all received assistance. And the old fidelity to Ireland remained. In 1893, for instance, 308 immigrants from 21 arriving ships received help. The birth of an independent Irish state was attended with widespread warfare, and in 1920, the Society provided $5,000 for relief of those who suffered due to hostilities. As conditions under a free and independent Irish government improved life on the island, emigration decreased. The Society encouraged greater interest in ties of friendship between America and Ireland. 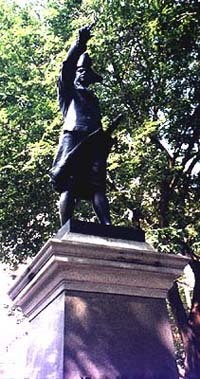 Such projects as the erection of a statue of Commodore John Barry, Father of the American Navy, in front of Independence Hall, and the Thomas Fitzsimons monument in Logan Circle symbolized the contributions of Irish people to the United States. To this day the Societys’ Benevolence Committee reviews, evaluates and makes recommendations regarding all requests for charitable contributions sought from our organization. In 1954, a biennial scholarship program to enable Irish graduate students to study in the United States was begun. Since the inception of this program, numerous graduates of Irish Universities have attained advanced degrees at the leading Universities in the metropolitan Philadelphia area. The scholarship program rates high on the list of the Society’s goodwill accomplishments. In 2016 the Society evolved to a focused commitment to fund scholarship endowments at the major Philadelphia area Universities. These endowments provide scholarships for students studying abroad in Ireland. In the past three years, starting in 2016, the Society has endowed over one million dollars in scholarships. The Society at this same time funded a scholarship endowment at Camphill Special Schools for children in need. 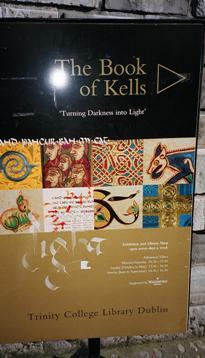 In 1990, the Society commissioned a facsimile of reproduction of the Book of Kells, which was donated to the Irish Library at Gwynedd Mercy College in Gwynedd, Pennsylvania. From 1845 to 1850, blight, starvation and subsequent emigration reduced Ireland’s population from nine million to four million. Many of those who fled Ireland came to the United States. 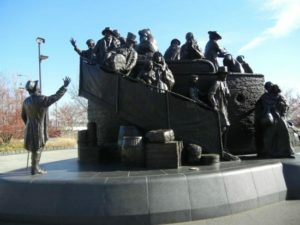 To commemorate the 150th anniversary of the Irish famine and its devastating effect on Irish people, civic leaders, government, private foundations and the Irish community worked together from the mid-1990’s through the new millennium on a $3 million project to plan and construct The Irish Memorial Monument in the Penn’s Landing area ofPhiladelphia. The Society was a leading organization in this endeavor, committing money, time, and people to this worthy cause. The Memorial, a national monument, opened to the public on October 25, 2003 and is dedicated to the memory of the more than one million who perished due to starvation and also recognizes the contributions of the Irish immigrants to Philadelphia and to this country. Spanning four centuries, the Society continues its proud tradition as the second oldest incorporated continuously meeting Irish organization in the United States.